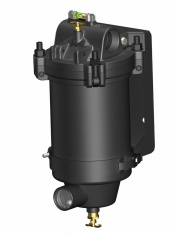 The PECOFacet VF-21SB/22SB are versatile, compact, light-weight housings and provide superior in-line filtration protection. Both interior and exterior surfaces of the carbon steel body are epoxy coated to protect against corrosion. This sturdy, single cartridge housing is easy to maintain and requires only 2” (51 mm) base clearance for cartridge change out. base clearance for cartridge change out.